Keeping a natural high quality sound is a high priority with Pitchometry and the formant options keep away the 'squeak' of high pitch shifts and keep low shifts from sounding dull and without fullness. 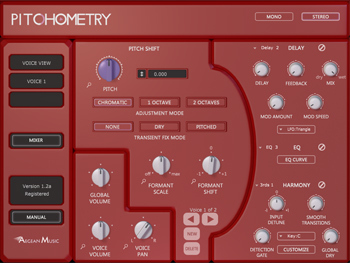 Finally Pitchometry does not suffer from the usually drawbacks of standard pitch plug-ins. It works with chords and polyphonic signals, human speech, and noisy signals with ease. Formant Shifting Controls allow the user to fine tune the frequency response of the shifted sound to make it as natural as possible, or to shift it radically up or down. 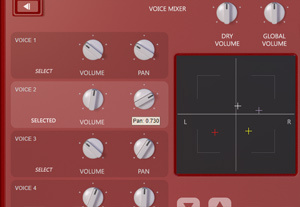 A Mixer screen is provided to let users adjust the volume of voices side by side and to add in the dry signal. Pan is also adjustable. LFO, envelope follower, and external modulation can be applied to the pitch or to various parameters. External modulation includes pitch shifts based on midi key messages and pitch wheels. Delay can be applied to voices individually, and has a host of controls such as feedback and modulation. Delay can add lush backing effects or offset voices to make them seem more independent. A special graphic EQ section can be applied to each voice. 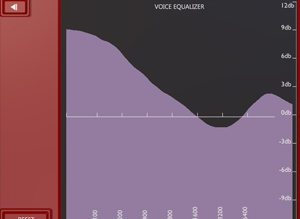 This specially created equalizer system lets you to draw the frequency curve you want. The Harmonize feature will detect the current pitch and offset the pitch shift by whatever value you desire. A scale can be shifted by minor and major thirds providing a traditional harmony, or any other combination you desire. Adding multiple voices lets you create chords and choruses of pitch shifted notes. Note transitions can be smoothed for a glide effect, and the input pitch can be offset for fine tuning. You can buy Pitchometry direct from us, available as an instant download. Click the Unregistered button when using Pitchometry and enter the codes into the boxes. Click enter and the activation should be complete. Windows - 7 or later version of Windows. A compatible program is required to use the plug-in.